The Cohen Film Collection is proud to announce that it will bring one of the final films of master director Claude Chabrol to Blu-ray and DVD. The digitally remastered Nightcap will be released in deluxe Blu-ray and DVD editions on September 30, 2014, with SRPs, respectively, of $39.98 and $29.98. 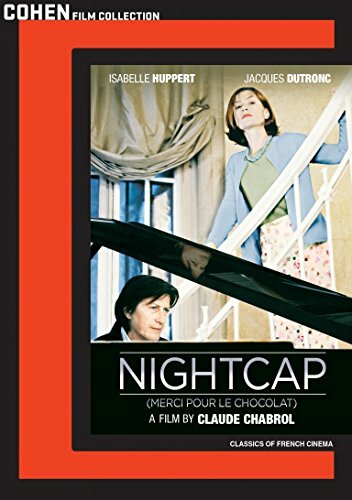 Nightcap (titled Merci Pour le Chocolat upon its original 2000 release) is a dark and droll thriller with comic undertones about the fine art of killing. Mika Muller (Isabelle Huppert, Ma mere, The Pianist) is the head of a Swiss chocolate company who is not above dispensing a potent blend of hot chocolate and dangerous sedatives to those who get in her way. After a brief marriage 18 years ago, Mika has recently remarried concert pianist Andre Polonski (Jacques Dutronc, Place Vendome, Every Man for Himself), and the two live with Guillaume (Rodolphe Pauly, The Romance of Astrea and Celadon), Andre's son from his second marriage who clearly shares none of his father's musical talent. Into their lives steps a young woman, aspiring pianist Jeanne Pollet (Anna Mouglalis, The Captive); she was born on the same day as Guillaume and, as we learn, was almost switched at birth with him. Does Jeanne's prodigious talent at the piano and her resemblance to Andre's late second wife hint at a deeper connection? As Jeanne draws closer and closer to Andre, she begins to suspect that Mika is drugging her stepson - and that she might have killed Andre's previous wife (her mother). The question for Mika is: Will there be enough chocolate to go around? Based on the novel The Chocolate Cobweb by Charlotte Armstrong, Nightcap is Claude Chabrol (La femme infidele, Le Boucher, La Ceremonie) at the top of his form. Susan Stark of the Detroit News called the film "an elegant, exquisitely modulated psychological thriller." Moira MacDonald of the Seattle Times said, "It's enough to watch Huppert scheming, with her small, intelligent eyes as steady as any noir villain, and to enjoy the perfectly pitched web of tension that Chabrol spins." "A sun-drenched masterpiece, part parlor game, part psychological case study, part droll social satire," said Glenn Lovell of the San Jose Mercury News. The Village Voice's J. Hoberman called it "Serious fun! A witty psychological thriller." Isabelle Huppert won Best Actress honors for the film at the Montreal World Film Festival and at France's Lumiere Awards, while director Chabrol won the prestigious Prix Louis Delluc. Blu-ray and DVD extras include running commentary by critics Wade Major and Andy Klein, a new critical essay and more. Bonus features on both Blu-ray and DVD: Feature-length audio commentary by critics Wade Major and Andy Klein; new essay by Peter Tonguette; 2014 re-release trailer.